When a company seeks to break ground on a new retail outlet in the Austin area, they need to first focus on choosing a firm that has experience when it comes to commercial building construction. That’s because the investment involved can be a steep one and making the wrong choice regarding that commercial construction company could be financially devastating to a business. Dealing with this sector of the construction industry should involve working with a commercial building contractor that has an established pedigree. That’s because their background has taught them what works best and what should be avoided. In addition, they also know how to properly assess any time frame involving commercial building construction. Too often, a commercial construction company trying to get their foot in the door will over-promise and under-deliver, given their inexperience in the marketplace. Either that or they’ll offer an inviting price when they bid on a job, which too often becomes a lament for the client who gets what they pay for when the job is completed. 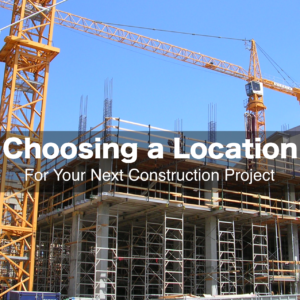 Some very good construction companies can establish themselves as a go-to firm when it comes to a particular niche sector. For example, some are skilled at retail construction, while others focus on office buildings or other type of facility. Yet there are very few businesses in this area that can claim to be flexible enough to handle any facet of the commercial construction industry. The comfort level of those niche companies is such that they may be content to simply offer up a benign, unimaginative concept, primarily because it’s something that’s worked in the past. However, companies that can adapt to whatever market they’re dealing with know that innovation is one of the keys to standing out among the crowd. Much like the above approach, where the commercial building contractor already has an established plan in place, making the wrong choice in this department can cause problems when it comes to communication. Any contractor should be willing to listen to what the client is asking and they should definitely keep them informed on the progress of the project. That’s especially important when it comes to meeting deadlines, since there’s nothing more aggravating than having to push back the opening of a business because a retail construction or commercial project is behind schedule. One of the main jobs of a contractor is to make sure that work is progressing or to work possible delays into a projection for completion of the project. Any good commercial construction company already has established relationships with suppliers that ensure that bottlenecks connected to deliveries are either non-existent or kept to a minimum. Companies still trying to establish themselves may have sketchy relationships with their suppliers, with the client paying the price for that weak relationship. The investment made in any commercial building construction project demands that such relationships already be strong. A client shouldn’t have to cross their fingers in the hope that things will go smoothly. Stovall Construction has served as commercial building contractor on countless projects for more than 40 years. Over that time, we’ve been able to handle many retail construction projects, which is why our clients use us again and again. So when you’re planning your next Austin retail project, give Stovall Construction a call.